Planning a low-waste event? You can reserve free recycling and organics recycling containers, signs, and bags to help reduce waste. Make sure the bins are conveniently located next to trash containers, near food and eating areas, entrances and exit points and other high pedestrian traffic areas. Request containers at least one week in advance to be sure we can guarantee your reservation! Event organizers are responsible for proper disposal of their materials. Recycling can be dropped off at St. Paul's free drop-off site, located at 309 Como Ave S.
The following District Councils also have recycling and organics containers they lend to neighbors. Not sure which district you live in? View the District Council map. Reserve event containers from Ramsey County Environmental Health on their website. In 2014, Saint Paul City Council updated city ordinance Chapter 366 to maximize waste diversion goals. Saint Paul is committed to protecting the environment and public health, reducing greenhouse gas emissions, and conserving energy and natural resources. Community events, parades, races, and public gatherings play a vital role in accomplishing these goals. The Waste Management Plan intends to aid event organizers in planning and reducing the waste generated at public events. Final Evaluation - Submit within 30 days after the event. Check out our Resource Guide to help you plan your recycling, organics and trash at large and small events. Plan ahead and you can reduce waste, which means less to deal with after your get-together. Download tips on holding Green Gatherings or a Green Graduation party. 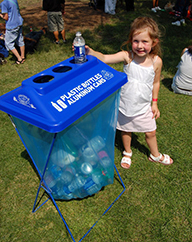 Download free signs or design your own on the Rethink Recycling website. Sings in Hmong, Somali or Spanish can be found at the BizRecycling website. When you call or email a facility about reservations ask the staff about options for recycling and composing. Most businesses have to provide recycling to their customers by January 1, 2016 at the latest. After you arrive locate the disposal containers and let your guests know where to put material for recycling, composting and trash. Visit the Park Facilities Rental page to reserve a public location for your event.